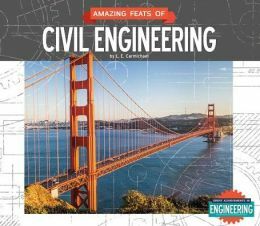 Part of the Great Achievements in Engineering Series for teens, this book introduces engineering concepts like settlement, load and sustainability through in-depth examination of three projects: Confederation Bridge, the Burj Khalifa, and the Panama Canal. It also explores both the history and future of this foundational field of engineering. I chose Confederation Bridge because I’ve actually been on it – it links New Brunswick and Prince Edward Island. I was sad to discover, however, that I was a couple years too late to visit the bridge museum. Because of my lousy spatial reasoning skills, I had a terrible time understanding how the Burj Khalifa – the world’s tallest building – actually manages to stand up. Fortunately, I have a very good friend who is also an engineer, and was kind enough to explain it to me. There are so many great documentaries about the Panama Canal, I was able to spend several hours watching TV and legitimately calling it work! "These thoughtful explorations of the importance and work of engineering add depth to science and career materials for skilled readers in the upper grades." "These substantial books begin with a brief introduction and history, then validate the “Amazing Feats” label with remarkable projects including the International Space Station, a thought-controlled bionic leg, the Canadian Confederation Bridge, and the driverless car; challenges and problem-solving are emphasized."